One Legal — Why did the court reject my filing? When the court rejects a physical filing, One Legal attaches a note to your order with the explanation provided by the court. When the court rejects an eFiling, the court clerk may provide a reason for the rejection at the time of processing. If provided by the court, the reason is attached to the filing or the rejected documents via a one-way communication from the court’s system. This electronic communication is received and displayed by the One Legal system. If you have any questions about the information provided by the court clerk, you will need to contact the court directly. 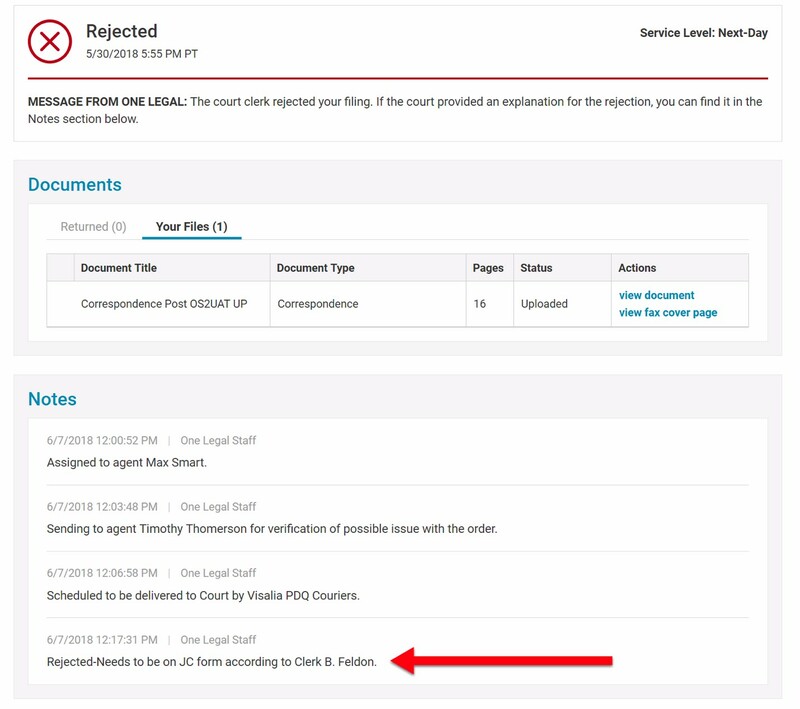 You can see the court rejection messages for either type of filing (physical or eFiling) by logging in to your One Legal account and clicking Orders. To learn about how to find a particular order in the list, click here. Click on the order number or the view details link in the Status column to view the Order Details page. 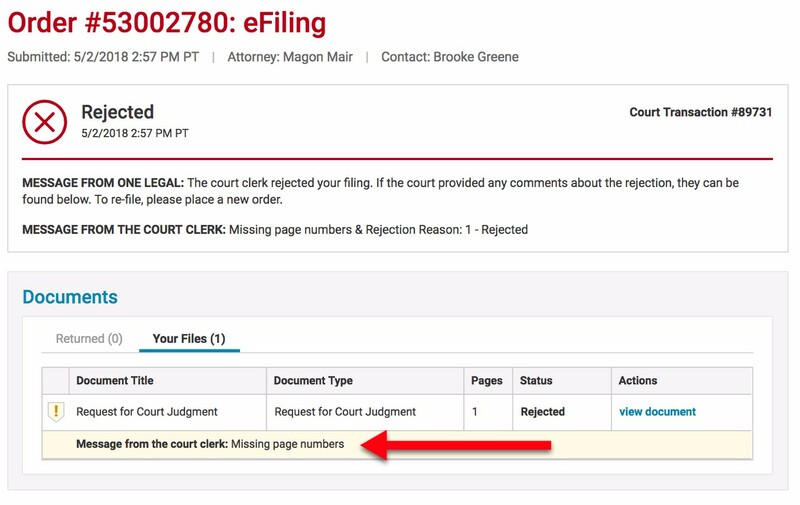 For physical filings, any information we receive from the court about the reason for the rejection is displayed in the Notes section at the bottom of the Order Details page. For eFilings, most courts provide rejection reasons at the filing level. These can be found on the Order Details page below the filing status with the label MESSAGE FROM THE COURT CLERK. Some eFiling courts provide a rejection reason for each document. These can be found in the Your Files list in the Documents section, in a yellow row with the label Message from the court clerk. You can also see the rejection reasons from the court in the email notification One Legal sends you when the court rejects an eFiling. 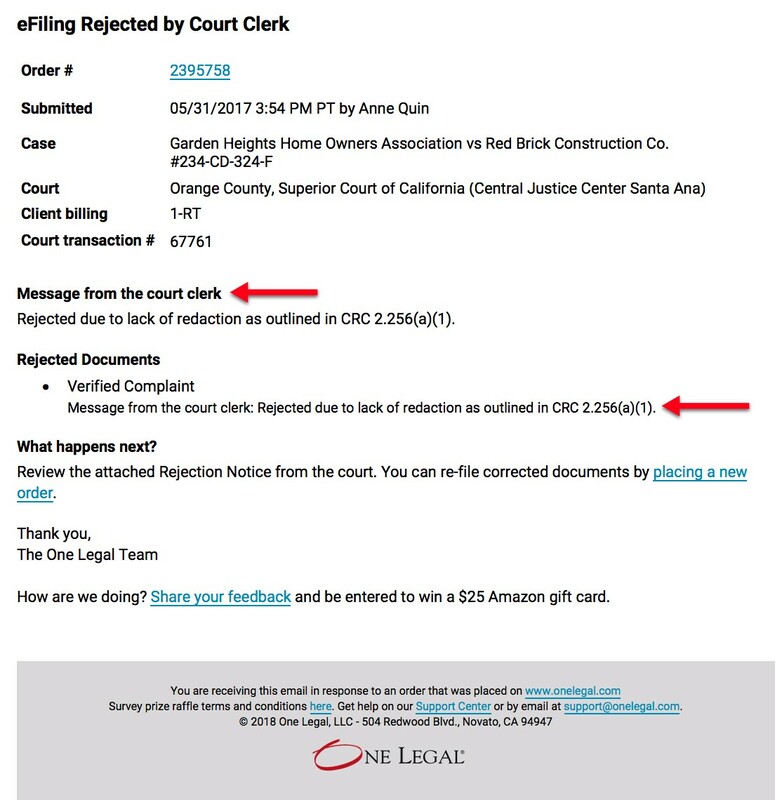 Just like the messages on the Order Details screen, these may appear at the top of the email (pertaining to the filing as a whole), and/or with the rejected document(s), depending on how the court provides the information. If no rejection reason is shown for a particular eFiling, there was no information provided by the court clerk who processed the rejection. To re-file corrected documents after a court rejection, place a new order. If you’d like assistance, our experienced legal support professionals are here to help with our Concierge service.